Trincomalee, Sri Lanka -- The Seruwila Mangala Viharaya in Trincomalee district is considered one of the most venerable ancient Buddhist temples to be found in the Eastern province where once Buddhism flourished at its peak. << The Chetiya at Seruwila Mangala Viharaya in which the forehead relic of Buddha was enshrined. According to historical annals King Kavantissa who ruled the Ruhuna built this temple 2231 years back by enshrining the forehead relic of Gautama Buddha. It is believed that three viharas existed at this particular spot built during the periods of three former Buddhas named Kakusanda, Konagama and Kasyapa with their relics enshrined and Gautama Buddha who was the last Buddha in this eon had personally visited this place and offered eight handfuls of 'Sapu' flowers. Gautama Buddha has not only foreseen that a king by the name of Kavantissa will build a temple with his forehead relic enshrined in it but has wished that this temple should be named 'Mangala' viharaya. King Kavantissa, father of King Dutugemunu who ruled the Ruhunu Rata after having obtained the forehead relic of Buddha was searching for a suitable site to build a vihara. Being an ancient custom the king directed the royal elephant to lead the way and the King himself with workmen and soldiers followed. After travelling for many miles the party arrived at a place known as 'Varahasondi' in Sri Gonapura, a region in Rajarata and the elephant remained unmoved. 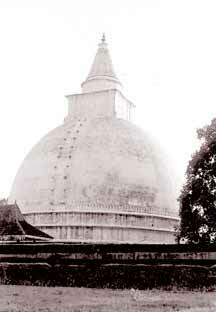 Instantly work was started and within a short period a vihara was built with a Stupa enshrining the forehead relic. King Kavantissa also built several other Viharas in the area and thousands of Buddhists were settled down. Buddhism flourished in this area for several centuries. With the invasion by Cholas and Pandyas from South India and the Sinhala Buddhist having to face the more powerful invaders in warfare found their existence unsafe and they migrated to the Hill Country leaving everything they had and thus the downfall of Buddhism in this area began. The Buddhist viharas were uncared for and with the growth of vegetation the most valuable Buddhist shrines gradually fell into ruins. The whole area became thick jungle infested with wild animals including elephants. Though the existence of the Seruvila Mangala Vihara was mentioned in the 'Dathuwamsa' and other chronicles no one made any attempt to discover this Vihara, not to mention restoring it. It was in the year 1920 that a young bhikkhu living in a temple at Dodanduwa in the Southern province after having read about the Seruwila Mangala Vihara which existed in the Eastern province was determined to discover it. The Bhikkhu Ven. Dombagasare Sumedankara had even dreamt of this vihara but the trip being so hazardous that the elderly bhikkhus would not permit him to make the expedition. But young Sumedankara Thera was bold in his decision he was even willing to sacrifice his life in the attempt and insisted that he should go to Trincomalee. After much persuasion he was permitted to make this trip and permission was obtained from the Governor to restore the Seruwila Vihara. In early 1923 young Sumedankara Thera arrived at Trincomalee by sailing vessel and proceeded to Muttur by sailing boat. Seruwila was about 14 miles from Muttur and the young bhikkhu began to walk the distance. It was the first time people living in that area had ever seen a bhikkhu in yellow robes. After reaching Toppur, a tiny hamlet inhabited by few Muslim families majority of whom were hunters. The Seruwila temple area was their hunting ground and even Veddhas lived in that jungle. Without any assistance from the inhabitants the young bhikkhu trekked the four miles in the jungle creeping through thorny bushes along a footpath used by hunters. At least he arrived at a place strewn with granite pillars in a large area where a huge mould of earth and bricks was also found. The centuries old Seruwila Mangala Vihara was finally discovered. The bhikkhu was so delighted that he kissed the earth and vowed that he will restore Mangala Vihara to the past glory. Back in Trincomalee he got round the few Sinhala Buddhist traders who are all from the South and they willingly agreed to help in this matter. Satisfied with the result of his endeavour he went back to Dodanduwa and many rich Buddhists pledged support in restoring the Seruwila Vihara, the chief supporter being the late Mudliyar D. D. Weerasinghe. On 23rd July, 1923 the Seruwila Mangala Maha Chetiyawardhana Society was formed and after clearing a roadway the restoration work started under most difficult conditions. However the society did the work in record time and the pinnacle enshrining ceremony was held on 8th of September, 1930. The young Sumedankara Thera has developed special herbal medicine for curing snake bite victims and the Muslims of Thoppur began to respect the Bhikkhu after curing a snake bite victim in the village whom the elders had declared dead. The young bhikkhu Ven. Dambagasare Sri Sumedankara became the Viharadhipathi of the Seruwila Mangala Viharaya and in the year 1962 he was made the Chief Sanganayaka of Negenahira Thamankaduwa Depalatha (Eastern and Thamankaduwa regions) and was conferred with the honorary title of Mangala Dharmakeerthi Sri Kalyani Wansika. It should be noted that no one can think of Seruwila Vihara without recalling the name of Sri Sumedankara Thera because they are so attached to each other.Ven. Dambagasare Sri Sumedankara was appointed Mahanayaka of the Kalyanawansa Chapter on June 18, 1984 and he passed away on 13th August, 1984 at the age of 92 years.